And – an educational activity that’s quite a blast … a few of the stories to tell you about – This Week at NASA! 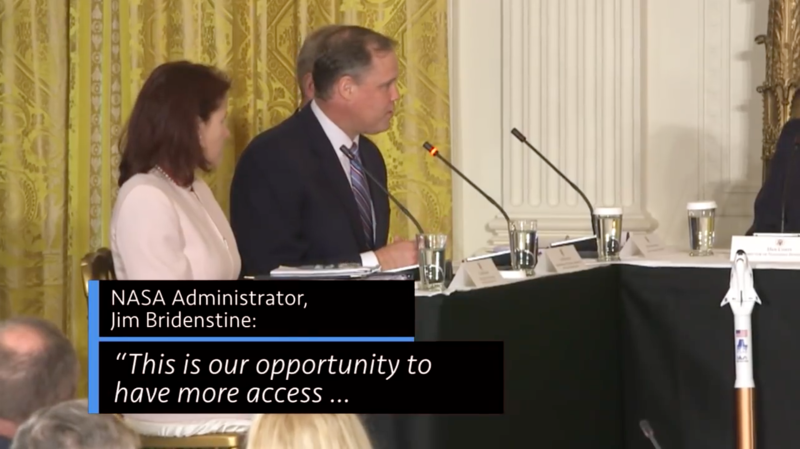 Administrator Jim Bridenstine attended the third meeting of the National Space Council June 18 at the White House. President Trump opened the meeting by signing Space Policy Directive-3, which directs the U.S. to lead space traffic management and mitigate the effects of space debris. During the meeting, which was led by Vice President Mike Pence, Bridenstine reported on NASA’s progress in implementing Space Policy Directive-1, which directs NASA to return U.S. astronauts to the Moon and eventually send humans to Mars. On June 21, we announced plans to seek a public/private industry partnership for a high-power solar electric propulsion spacecraft to provide power, controls, and communications for the first element of our planned lunar exploration platform, known as the Gateway. Built with commercial and international partners, the Gateway will become the orbital outpost for robotic and human exploration operations on and near the Moon and beyond – including Mars. A new multiagency report released June 20, details plans for the U.S. response to near-Earth objects that could pose a hazard to Earth. Titled, “National Near-Earth Object Preparedness Strategy and Action Plan,” the document identifies actions to enhance the federal government’s coordination and preparedness posture during the next 10 years to address potential hazards posed by near-Earth objects. For information about NASA’s Planetary Defense Coordination Office, visit: nasa.gov/planetarydefense. Our Wallops Flight Facility in Virginia held its annual Rocket Week, June 15-22. It’s an opportunity for students and instructors from across the country to learn more about rocketry basics and build experiments for flying on a NASA suborbital rocket through the RockOn! and RockSat-C programs. Rocket Week is one of many events we sponsor to stimulate student interest in science, technology, engineering and mathematics, or STEM, careers.